In the latest installment of CabinFever presents, sound artist Stephan Moore unveils a series of field recordings documenting his travels to Cairo, Egypt and Doha, Qatar. Visiting these cities and interacting with their cultures, populations, rhythms, and sounds for the first time, Moore made dozens of recordings to create an aural record of his journeys. Accompanied by images to further contextualize this Chicagoan’s creative relationship with the environments he traversed during March, this project distills human memory down to its most immediate, sensory components, providing a map of the artist’s lived experience. In February and March 2018, I taught a class on creative audio performance for Northwestern University in Qatar. While in Doha, I kept my usual practice of making field recordings of the environments I encountered. In early March, I took advantage of the school’s spring break to take a side trip to Cairo, Egypt, and there again I found much to record. When asked by CabinFever to create work for the CabinFever Presents series before I left home, I thought I might use field recordings to talk about my experience of these two cities, perhaps finding audible evidence of their difference in age; Cairo was founded in the 10th Century and has seen all manner of ups and downs, while Doha has exploded into a modern metropolis in the past 20 years. Before this trip, I had never visited this part of the world, and my knowledge of the local cultures, politics, and geography was largely shaped by what I had encountered as a consumer of American news media. I knew better than to walk in with any expectations, but it wasn’t until I arrived and began to listen that I was shown the depths of my ignorance. There is much to say about these amazing places, their fascinating cultures, and the people I met—students, professors, and others—but, so close to the experience, I can’t begin to do these things justice. Instead, I want to share these four recordings, selected from dozens. For me they are a way back into the direct experience of being there, unmediated by language. The recordings are not “pure” but have been modified with small, subtle edits, some EQ to remove wind noise or give a better spectral balance, and some compression to improve the clarity. The result is hopefully only slightly hyper-real, as my intent is to present these sonic environments as I experienced them, not as my microphone experienced them. The recordings are long and develop slowly, and generally won’t sound good when played through earbuds or computer speakers, or played at a quiet volume. Ideally, the listener will use good speakers or over-the-ear headphones and seek a mindset for listening that sheds the usual expectations we have of music and allows them to be transported to a new place. I experimented with a few different titles for this collection. In the end I settled on "Jugaad," a Hindi word I learned during this time, which roughly means “a creative solution crafted from meager resources,” an apt description of my state of mind during this time (if not my material reality). I wish to thank Natasha in Cairo and Kaumudi in Doha, who transformed my experience of each place through their navigation and generosity. Northwestern University in Qatar occupies an enormous, beautiful building in Doha’s Education City area. Open only a year by the time of my arrival, some of the building’s systems are still undergoing calibration and adjustment. My favorite daily walk on campus started when I exited the elevator on the 2nd floor above the coffee shop, and then crossed a wide, sloping bridge suspended between the two main arms of the building. Encased in glass, the bridge was often in direct sunlight, and the air handling system installed above it seemed to struggle to deal with the constant influx of hot air. Each of the various parts of this system struggled in a distinct way. One morning, when it seemed most people were in class or meetings, I took off my shoes and made a Pauline Oliveros-style slow walk from the elevator across the bridge, holding a microphone directly over my head, pointed up into the whirring mechanisms above me. Paying close attention to the distribution of weight between my feet, I was able to maintain a constant speed, extending a walk that normally took about 45 seconds into more than 25 minutes. This recording captures a large segment of that walk. Four stories beneath my hotel room window, the street Kasr al Nile connected Talaat Harb Square with some of Cairo’s central open market areas to the northeast. It was neither a large street nor a small one, and near my hotel it had no signals to regulate the flow of traffic. Yet, in the early evening each day, the amount of traffic noise was incredible. It wasn’t merely loud, but somehow strangely festive, with an incredible variety of horns used to express an equally broad range of sentiments. The long, flat buildings pushed right up against the street created a perfect set of reflective surfaces to channel in sounds from a great distance away. Coherent musical phrases spun out from the chaos, often performed by a group of drivers located nowhere near each other. I found that, as much as I wanted to go out and explore, I was completely enchanted by this sound and could have stayed in my room listening to it for hours. An oliphant is a type of ivory horn used on hunting expeditions. 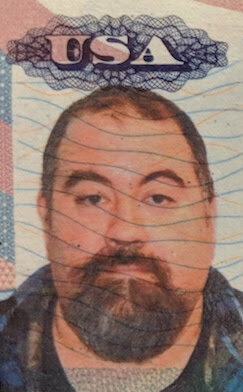 As I listened, I felt I could attribute a kind of calling out, an announcement of location and identity, in these horns. The next day, I encountered an oliphant in a museum and the ideas connected – horns are for the hunt. At some point, I began referring to my university-assigned housing unit as “The Bubble.” On the 24th floor of a building twice as tall, it had a wraparound balcony that allowed me to look out onto the northern section of West Bay, a portion of Doha still undergoing heavy construction. For every completed skyscraper in my view, another two were being built. Some were beehives of activity while others seemed abandoned at various stages of development. Had the developers run out of money? Were things stopped because of the blockade? Closest to The Bubble were three buildings. One was a new Mariott Hotel under construction, with the structure fully framed but completely exposed to the elements. Every day except Friday, workers filled the building and operated three large cranes. A constant stream of construction noise poured out of the building, accompanied in the night by work lights. A second building was a low-lying structure called Qatar Cool. 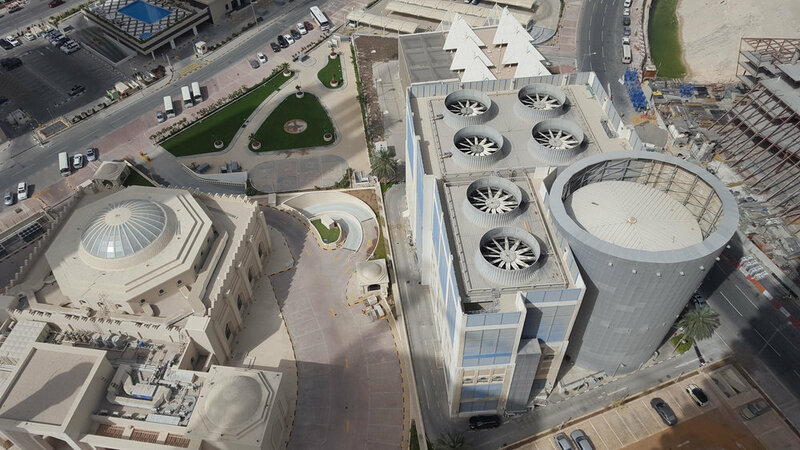 With several giant fans mounted on its roof, Qatar Cool provided air conditioning to the buildings in the local area, including, I assume, my own. It also provided a constant blanket of otherworldly noise that expanded into the space between the skyscrapers. The third building was the brand new and beautiful Jamia Masjid Mosque, whose minaret was directly below my balcony. The call to prayer, always delivered by the same singer, was blasted out at top volume, thundering through the built environment and echoing in its enormous space. This recording captures the three buildings in their mutual sonic expression as heard from The Bubble’s balcony – the first part was recorded just before noon, then after 2.5 minutes the recording shifts to a time 12 hours later, when the cooler temperature and calmed breeze allowed the construction crew to pick up its pace. Throughout, Qatar Cool continued its work. I spent a lot of time trying to get places on foot in Cairo and getting lost. Three days in a row, I tried to make it to Al Azhar Park on the eastern end of downtown. Each day I got lost in new ways, and ended up finding other amazing places. On the last day, though, I was determined. The streets were crowded and various paths were blocked as the Saudi Prince was making a visit to Cairo, and his motorcade had an incredible security detail. I had to stay off the main roads and wander through alleys using my best guess at a dead reckoning. Finally, I climbed through a parking garage and managed to find the entrance. Al Azhar Park turned out to be huge and topographically complicated, full of elevated areas where one could get a view south to the citadel, and west across the whole of downtown back towards the Nile. I could see all of the alleys and streets where I had taken a wrong turn or gone in circles. And across my field of vision were hundreds of minarets, each home to a different singer, preparing to issue the call to prayer at the moment of the sunset. I positioned myself on the edge of a wall atop the highest hill in the park, and found the best place to capture the panorama of sounds. At the last minute, a group of young people climbed up on the wall with me and proceeded to talk and laugh as the calls began. At the time, this annoyed me, but now listening to the recordings, it’s nice to hear their voices in close range, in contrast to the deep soundscape of hundreds of amplified voices singing without any coordination. After the initial sound of the call, there is a lull, and then the final singing that ends the prayers begins in a much more staggered cadence, stretching over several minutes until only one voice remains. I am not sure what these recordings show in aggregate. The most interesting sounds I found in Cairo were those of the city’s lifeblood, its daily functioning in great detail and complexity. Doha is, by comparison, still a blank slate. Its sounds are those of technology, functioning or malfunctioning, a place that was recently desert still coming into being. So much has yet to be decided, and so many blanks have yet to be filled in. As I was preparing to leave Doha a few days before producing these recordings and accompying text, I was asked many times what my impression of the place was – by colleagues, by students, and by natives. The only answer I could muster is that I felt like I had read one chapter in a really compelling book, and now I wanted, more than anything, to know what happens next. 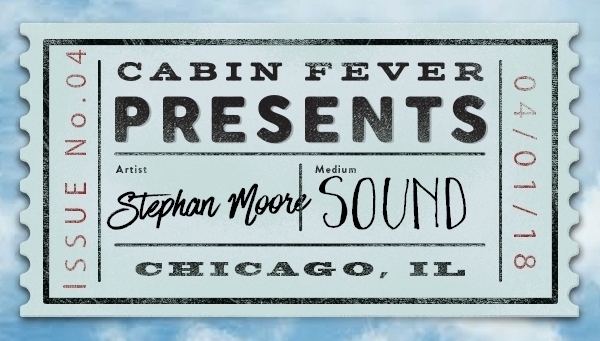 Stephan Moore is a sound artist with a practice that encompasses field recording, physical computing, theatrical sound design, and improvisation. He teaches in the Sound Arts and Industries program at Northwestern University, and is the curator of the Soundpark initiative at the Caramoor Center for Music and the Arts in Katonah, NY. He lives in Chicago.